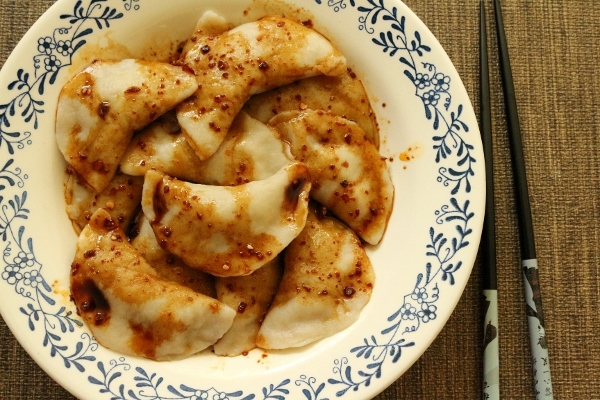 As a dumpling lover and fan of Andrea Nguyen's books and websites, I have a growing list of dumplings to try making at home, whether traditional or untraditional (Buffalo chicken dumplings, anyone?). 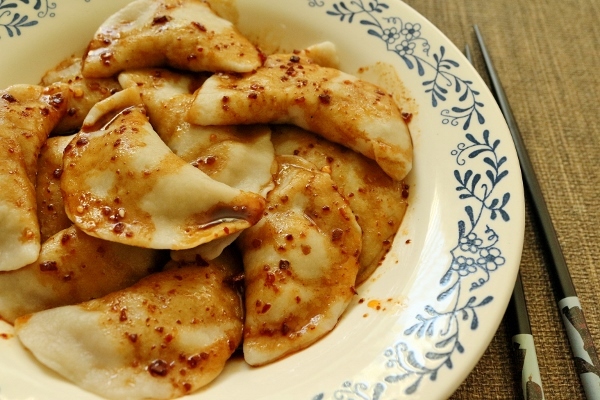 I while back, I bookmarked a recipe on Viet World Kitchen called Sichuan Crescent Dumplings. I was intrigued not only by the filling, which is composed of ground pork, scallions, and ginger-infused water, but the spicy sauce served over these boiled dumplings. 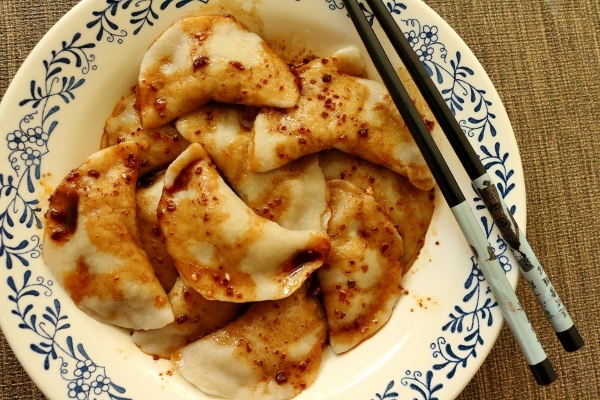 Since these dumplings are made with a basic flour-based dumpling dough, they are easily frozen, and since they are meant to be boiled, they don't even need to be shaped any further than folding and pressing into a simple crescent. 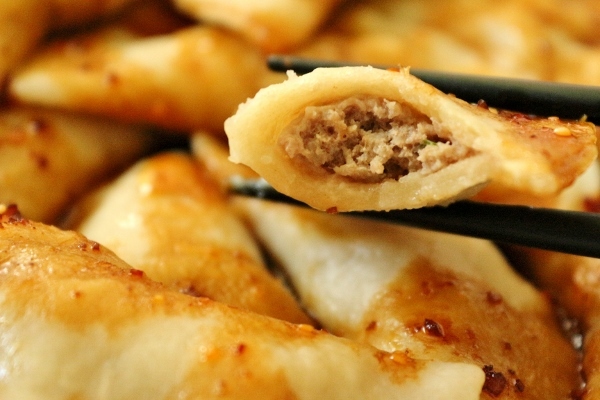 They are a touch smaller than some other dumplings--a batch of dough yields 40 dumplings instead of the typical 32. To be honest, when I assembled these bad boys I didn't even eat them that day, I froze them all! I knew they would freeze well, and I had plenty of other dumplings to enjoy including Chinese chive dumplings and three-mushroom dumplings. The main adjustment I made to Nguyen's recipe on her site is that I lightly salted the water I used to boil the dumplings and boiled them for closer to 5 minutes instead of 6. The first batch I boiled tasted a bit underseasoned to me, even with the intense sauce. The dumplings themselves were missing a bit of salt (perhaps this could be due to the fact that I use kosher salt and I believe Nguyen uses sea salt), but salting the water for the following batches of dumplings seems to fix this problem. All dumplings after the first batch tasted perfect to me, and the sauce is outrageously good with a nice kick. I used homemade chili oil and included some of the chili sediment as well. Halve the ginger lengthwise. Put it cut side down on your work surface, then smash the ginger with the flat side of your knife. Give it a couple of good whacks. Transfer to a bowl and pour the water over it. Set aside for 15 minutes to soak. Meanwhile, make the basic dumpling dough, if you have not already. Set it aside to rest. Drain the ginger liquid, and discard or save the ginger for another use. (It has about half of its original strength.) Add the salt, pepper, egg white, soy sauce, and rice wine. Stir to combine the seasonings well. 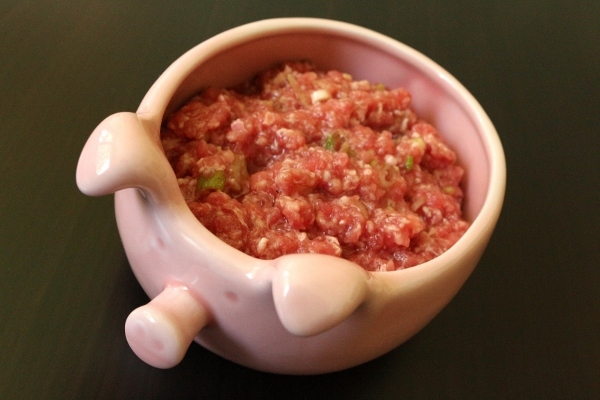 Put the pork and scallion in a bowl. Use a fork to break it up. Gradually stir in the liquid seasonings. When all the liquid has been added, stir the pork vigorously, almost beating it, to create a soft mixture that is slightly sticky. You don’t want to see any liquid visible. Cover and set aside for 30 minutes. The filling can be made 1 day in advance and refrigerated; return to room temperature before using. You should have about 1 2/3 1 3/4 cups. Stir together all the sauce ingredients to dissolve the sugar. Set at the table. In the meantime, make 20 wrappers from half of the dough. (Or, make 10 at a time from a quarter of the dough.) Aim for 3-inch-wide wrappers. For guidance, read here (or pages 24-25 of Asian Dumplings) and watch this video on how to form basic dumpling wrappers. When a batch of wrappers is done, assemble some dumplings. For each one, take a wrapper and hold it in a slightly cupped hand. Scoop up about 2 teaspoons of filling with a bamboo dumpling spatula, dinner knife, or fork and position it slightly off-center toward the upper half of the wrapper. Then fold and press to create a crescent-shaped half moon. 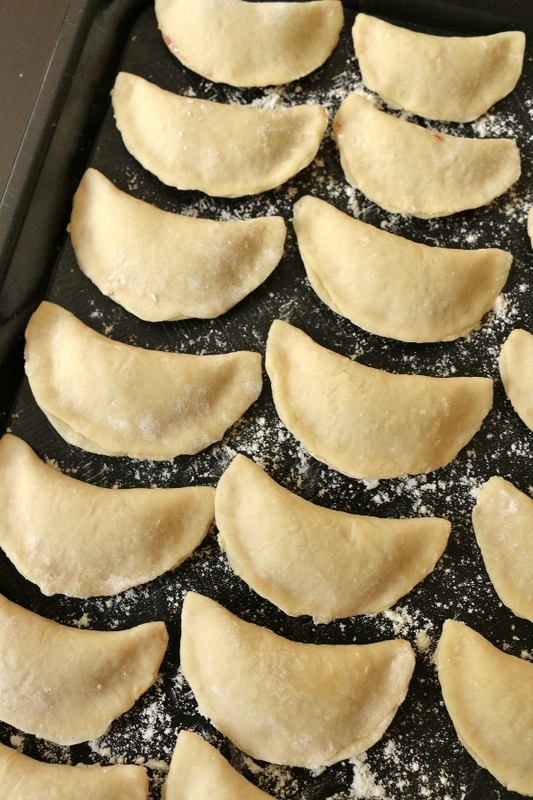 Place each finished dumpling on a parchment paper-lined baking tray with a good 1/2 inch between each. Repeat with the other wrappers before forming and filling wrappers from the remaining dough. Cover the finished dumplings with a dry dishtowel as you make the rest. To cook the dumplings, fill a large pot half way with lightly salted water and bring to a boil over high heat. Gently drop half of the dumplings into the water, then use a wooden spoon to nudge them to prevent sticking. Cook the dumplings for about 5 to 6 minutes, or until they float to the surface, look glossy, and are puffed up and translucent. Use a slotted spoon or skimmer to scoop out the dumplings from the pot, briefly drain, and deposit in a shallow bowl or serving plate. Cover with a large inverted bowl to keep warm. Return the water to a boil and cook the remaining dumplings. When they are done, return the first batch to the water to reheat them for a good minute. Serve the hot dumplings immediately with the sauce either in a communal bowl for people to help themselves or divided up among individual rice bowls or large dipping sauce dishes.